The Epitaph gave voice to those who were troubled by the event, empathizing with the view that this was indeed a “Sad Affair,” while at the same time offering the backdrop of recent history that led up to the shooting. The Epitaph and other supporters would view the Earps as responsibly discharging their law enforcement duties. Others would see the lead-up and gunfight as a premeditated provocation for the deliberate killing of enemies. An open debate would ensue, many in Tombstone seeking an answer as to why their streets were the scene of such bloodshed. The differing sides to the controversy became polarized to a degree by opposing newspapers, the Epitaph and the Democratic - leaning Tombstone Daily Nugget. It was quickly known who died as a result of the shootout, but as for who was at fault, that argument was just beginning. The debate between local rival presses would move beyond the boundaries of Tombstone proper, as the press in other cities would also argue against each other over the matter, often based on political association. The opinions of the Nugget were often echoed by other Democratic-leaning papers while the Epitaph found itself echoed by the Republican-leaning press. For the Earps to find favor in the court of public opinion, an explanation was clearly warranted. And such an explanation was not without merit. There had been a series of circumstances that had turned both sides of this fight into angry opponents of each other. But by virtue of the fact that there were no fatalities on the Earp side, it would become of paramount importance to their personal reputations to gain support locally. The Epitaph offered up its defense of the Earps. It was true that many in Tombstone blamed the cowboys for the hard name by which Tombstone had come to be known, but there were many who were shocked by the shootings and questioned the justification of these deaths. The Epitaph’s coverage offered a contrast to the growing fervor against the Earps and Doc Holliday. Although none of the three deceased were responsible for White’s death, the Epitaph was tying them to a larger group of concerns and to those who had brought crime and a bad reputation to the Tombstone District. This troubling sense of lawlessness that plagued the Tombstone District would now be personified to a degree, in the form of Frank and Tom McLaury, and Billy Clanton. Another of the issues that would arise during the Spicer Hearing, that would also find voice in Judge Spicer’s decision, was the role that Doc Holliday played in antagonizing the situation. Few in Tombstone would enthusiastically refer to Holliday as a “peaceable and unoffending citizen.” The Earps’ friendship with Holliday, and his role in the lead-up to the fight, would remain an Earp liability throughout the proceeding, so much so that Wyatt Earp would explain during the Spicer Hearing how he became friends with Holliday and why he remained friends with him throughout his time in Tombstone. But posturing aside, the Epitaph did offer valuable detail for those in Tombstone who were unaware of the ongoing troubles between the Earps and the cowboy faction that had been occurring for some time. The Epitaph continued, “Shortly after this occurred some one came to the Marshal and told him the McLowrys had been seen a short time before, just below town. Marshal Earp, not knowing what might happen and feeling his responsibility for the preservation of the peace and order of the city, staid on duty all night and added to the police force his brother Morgan and Holliday. The night passed without any disturbance whatever, and at sunrise he went home and retired to rest and sleep. A short time afterward one of his brothers came to his house and told him that Clanton was hunting him, with threats of shooting him on sight. He discredited the report and did not get out of bed. It was not long before another of his brothers came down and told him the same thing, whereupon he got up, dressed and went with his brother Morgan up town. They walked up Allen street to Fifth, crossed over to Fremont and down to Fourth, where, upon turning up Fourth toward Allen, they came upon Clanton, with a Winchester rifle in his hand and a revolver on his hip. The Marshal walked up to him, grabbed the rifle and hit him a blow at the same time on the head, stunning him so that he was able to disarm him without further trouble. He marched Clanton off to the police court, where he entered a complaint against him for carrying deadly weapons, and the court fined Clanton $25 and costs, making $27.50 altogether. This occurrence must have been about 1 o’clock in the afternoon.” When stating that Virgil Earp “staid on duty all night,” John Clum’s Epitaph continued to present the Earps to their readers in the best possible light, portraying as dedication Virgil’s all-night vigil, albeit at a poker game. Though it was already common knowledge who shot the deceased, Dr. Mathews presided over the coroner’s jury to determine an official report. The gunfight aftermath would also prompt a group of organized citizenry, founded to keep civil order in just such a situation, to spring into action. Growing uneasiness in the Tombstone District had motivated the formation of a group known as the Citizens’ Safety Committee. They had their first meeting in the wake of the Schneider shooting at Charleston in January of 1881, which was quickly followed by an angry Tombstone mob demanding a quick lynching of the shooter, Michael Rourke, aka, Johnny Behind the Deuce. In order to respond to such an outbreak of violence, this group had a prearranged signal that would bring their numbers onto the street in case of civil unrest. John Clum recalled the vivid sight. “All members of this committee were properly armed and pledged to assemble on call in front of my office in the Epitaph Building on Fremont Street. The Vizina Hoisting Works was located within the city, and a certain signal from the Vizina whistle was agreed upon as an emergency call for this committee to report for duty. “A detachment of this Citizens Safety Committee, fully armed and marching in a ‘column of twos,’ reported to me in front of the Epitaph office within 10 minutes after the fight on October 26th. The fight occurred on Fremont Street less than 100 yards from the Epitaph Building.” For all the drama of the moment, a humorous and enduring image remained with him nearly 50 years later. “I distinctly remember the first ‘set of twos’ was made up of Col. William Herring, attorney at law, and Milton Clapp, cashier of the local bank. Col. Herring was tall and portly, with an imposing personal dignity, while Milton Clapp was short and lean and wore large spectacles. The striking contrast in stature and bearing between these two leaders of the ‘column’ registered an indelible picture…That still intrudes as a flash of comedy in an exceedingly grave situation. “It was in view of the foregoing facts and circumstances that I sustained the action of the city police in the street battle of October 26, 1881, both as mayor of the city and as editor of the Epitaph.” Clum remained strong in his support of the Earps in this 1929 article, just as his Epitaph had been in 1881. The Epitaph continued its report, citing its view of public opinion. William Herring, who represented the Earps in Contention City after the Spicer Hearing. John Clum later recalled Herring lining up with the Tombstone vigilantes. Courtesy of Roy Young. Thus the Epitaph had offered its opening salvo in the heated debate which was just beginning. As friends and supporters of the deceased formed the largest funeral procession that Tombstone had ever seen, the contest between vindication of the Earps and the criticism of them for these shooting deaths was clearly on. And the beginning of a movement to conflate the activities of the McLaury brothers with the much hated stage robbers was also underway. It was a conscious decision made in the Epitaph’s article to point out the involvement of the Earp brothers in the pursuit and capture of stage robbers. Few could argue in favor of these “knights of the road,’ the murders they committed, and the financial losses that they caused. At the same time though, the McLaury brothers were not among the group that murdered Bud Philpot during a botched robbery attempt that shocked the area and was mentioned during the Spicer Hearing. For all the history that Tombstone diarist George Parsons witnessed and chronicled, he was out of town on the day of the gunfight. But upon his return Parsons quickly learned of the event as Tombstone’s streets were in a pitched fever over what had just taken place. Parsons knew well enough that trouble had been brewing between the participants of the fight, and was not surprised at its occurrence. The Nugget’s first report of the event is remembered for its effort to be fair, and would be backed up by some of the testimony in the hearing to come. Journalist Richard Rule worked at the Tombstone Nugget at the time of the gunfight. But once Rule’s superior at the Nugget, Harry Woods, returned to Tombstone, the Nugget would take on a much more partisan tone regarding the matter, and an escalating war of words between rival publications would ensue. As Frank McLaury saw the Earps and Holliday before him, he was faced with not only a well-armed group of determined men, but also a decision. Sheriff Behan had ordered Frank to give up his gun, and he was put under arrest. But Frank rejected Behan’s authority as Cochise County Sheriff by refusing to be disarmed and placed under arrest. The fact that Wyatt had struck his brother Tom may have influenced Frank’s deliberations at this critical moment. Behan recalled that he “came down to the corner of Fourth and Fremont. There I met Frank McLaury standing in the street holding a horse. I told him I wanted him to give up his arms. He said he would not, without those other people being disarmed. I suppose he meant the crowd; Holliday, Earp and others. He said he had done nothing and did not want to make any fight. I looked down Fremont Street and saw the Clanton brothers and Tom McLaury and I say to Frank, ‘Come with me,’ and we went down to where the boys were standing…I said to them, ‘I want you to go up to the Sheriff’s Office and lay off your arms.’ Frank McLaury rather demurred from going up, and gave as his reason that he wanted the other party, the Earp party, disarmed as well.” This placed Behan in an untenable position. Frank was demanding that he disarm Tombstone’s City Marshal (Virgil was also a U.S. Deputy Marshal), and his chosen deputies. The jurisdictional issues alone complicated the matter, and the Earps understandably did not agree to this. Had Frank and Billy Clanton allowed themselves to be disarmed under the authority of Sheriff Behan, the entire momentum that was leading to the shooting would have been disrupted. (Whether or not Tom McLaury was armed is still debated today.) Of those present in the Earp faction during the shootout, Doc Holliday had a proven short temper, and was known for his angry use of his pistol. But even with his explosion of anger at Ike Clanton the night before in the Alhambra Saloon, Holliday did not shoot at Ike, as Ike was unarmed at the time. Even Doc Holliday knew full well that shooting an unarmed man was an indefensible crime for which he would surely be punished. And in the context of the gunfight as it was unfolding, Wyatt Earp did not fire at an unarmed Ike Clanton as he ran toward him, foregoing the easiest shot of the day. Just as Wyatt Earp and Doc Holliday knew not to shoot at an unarmed man, Frank McLaury had to have known of the same code of conduct. Sheriff John Behan, whose efforts at disarming the McLaurys and Billy Clanton just before the Earps and Doc Holliday confronted them failed. Copy photo from the collections of John D. Rose. While Sheriff Behan remained unsuccessful in disarming the cowboys, City Marshal Virgil Earp decided that it was time that he and his brothers and Holliday handle the matter. Precious moments had been lost as Frank defied Behan’s authority. The Earps had already left Hafford’s corner, at Allen and Fourth, traveling north on Fourth Street, then turning west on Fremont street. As they traveled Fremont Street, they soon encountered Behan as he urged them not to continue on. As the Earp party reached the cowboys, Virgil demanded they give up their arms. And for the second time that day, Frank refused to surrender his gun. Refusing Behan’s and Earp’s order was a critical error on his part. One can speculate how matters might have unfolded had Wyatt Earp not struck Tom McLaury on the head in the hours that preceded the fight. Franks’ next action was one of initial defiance. A careful reading of the Nugget notes that Frank was first to reach for his gun. This was all the provocation that Wyatt Earp needed to reach for his, and he was able to fire on McLaury first. The Nugget continued. “As he [Virgil Earp] spoke Frank McLowry made a motion to draw his revolver, when Wyatt Earp pulled his and shot him, the ball striking on the right side of his abdomen. About the same time Doc Holliday shot Tom McLowry in the right side, using a short shotgun, such as is carried by Wells, Fargo and Co,’s messengers. In the meantime Billy Clanton had shot at Morgan Earp, the ball passing through the point of the left shoulder blade across his back, just grazing the backbone and coming out at the shoulder, the ball remaining inside of his shirt. He fell to the ground, but in an instant gathered himself, and raising in a sitting position fired at Frank McLowry as he crossed Fremont street, and at the same instant Doc Holliday shot at him, both balls taking effect, either of which would have proved fatal, as one struck him in the right temple and the other in the left breast. “Virgil Earp in the right leg, the ball passing through the calf, inflicting a severe flesh wound. In turn he had been shot by Morg Earp in the right side of the abdomen, and twice by Virgil Earp, once in the right wrist and once in the left breast. Soon after the shooting commenced Ike Clanton ran through the O.K. Corral, across Allen street into Kellogg’s saloon, and thence into Toughnut street, where he was arrested and taken to the county jail. The firing altogether didn’t occupy more than twenty-five seconds, during which time fully thirty shots were fired. After the fight was over Billy Clanton, who, with wonderful vitality, survived his wounds for fully an hour, was carried by the editor and foreman of the Nugget into a house near where he lay, and everything possible [was] done to make his last moments easy. He was ‘game’ to the last, never uttering a word of complaint, and just before breathing his last he said, ‘Goodbye, boys; go away and let me die.’ The wounded were taken to their houses, and at three o’clock this morning were resting comfortably. 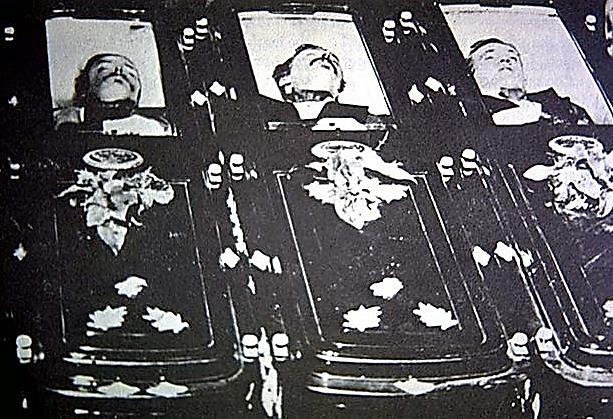 The dead bodies were taken in charge by the Coroner, and an inquest will be held upon them at 10 o’clock to-day. Upon the person of Thomas McLowry was found between $300 and $400, and checks and certificates of deposit to the amount of nearly $3000.” Adding to the irony and drama was that Sheriff Behan, ignored by Virgil Earp and Frank McLaury prior to the fight, was now ignored by everyone during the fight. At the conclusion of the gunfight, the Citizens Safety Committee sprang into action. It was a dramatic response equal to what had just occurred as well-armed men stood on a Tombstone street, ready for service to law enforcement to restore order if need be. “When the Vizina whistle gave the signal that there was a conflict between the officers and cowboys, the mines on the hill shut down and the miners were brought to the surface. From the Contention mine a number of men, fully armed, were sent to town in a four-horse carriage. At the request of the Sheriff the ‘Vigilantes’ or Committee of Safety, were called from the streets by a few sharp toots from the Vizina whistle. During the early part of the evening there was a rumor that a mob would attempt to take Ike Clanton from the jail and lynch him, and to prevent any such unlawful proceedings a strong guard of deputies was placed around that building, and will so be continued until all danger is passed. At 8 o’clock last evening, [Phineas, “Phin”] Finn Clanton, a brother of Billy and Ike, came in town, and placing himself under the guard of the Sheriff, visited the morgue to see the remains of one brother, and then passed the night in jail in company with the other. A.J. Ritter, of Ritter and Ream, who were the undertakers for Frank and Tom McLaury and Billy Clanton. Copy photo from the collections of John D. Rose. Under magnification the man seated on the left bears a resemblance to A.J. Ritter. The shootout preoccupied the conversation on the streets of Tombstone, and within many of its homes. The Daily Nugget and the Daily Epitaph, the two primary newspapers in Tombstone at the time, were eager to provide its curious populace with news from the Spicer Hearing. An unfortunate decision by Judge Spicer resulted in reporters being excluded from the proceedings at the request of the Earps’ counsel. Even the Epitaph, staunch in their support for the Earps, argued strongly against it. But public pressure would later force a reversal of this poorly thought out decision. “The late tragedy is still the common topic of conversation, though the excitement is somewhat allayed by the exclusion of the public from the examination and the refusal of Judge Spicer to allow the proceedings to be published. A garbled statement of Coroner Matthew’s testimony was yesterday published, and the court ruled that any attorney who would here-after furnish testimony to the press would be fined for contempt. The exclusion of the public from the examination is in accordance with a territorial law allowing that privilege to the defense. Aside from the debate regarding the press, there was also a disagreement over who would record the testimony during the hearing. “Mr. E. [Eugene] W. Risley, phonographic reporter who was sent for at Tucson, having been objected to by the prosecution.” Judge Spicer replaced Risley with Fred W. Craig. Unfortunately, Billy Allen’s testimony occurred at the inception of the hearing; the fate and accuracy of his testimony would be affected first by Spicer’s early press ban and decades later by an incomplete transcription of the court records. Author William Shillingberg wrote of the original court transcription. “For decades this document lay undisturbed in the Cochise County Courthouse. During the 1930s Pat Hayhurst, an Arizona journalist, publicist for the State Industrial Commission, and acting state director of the WPA, removed it along with other related papers to type a copy as part of Roosevelt’s Federal Writers Project. Unfortunately, he summarized much of the material so that his version is not a complete record, nor are the witnesses listed in proper order. Later the original document was either lost, stolen, discarded, or destroyed in a house fire, depending on which rumor one wishes to believe.… Hayhurst’s typescript is of value, but only when compared alongside the almost verbatim reports of testimony carried in the surviving issues of both newspapers [referring to the Epitaph and Nugget].” Billy’s testimony in the hearing would not have this advantage. Due to the absence of the original court reports and early newspaper coverage, the Hayhurst manuscript is the only version known of Billy’s testimony at this time. In one of the great ironies of his time in Tombstone, Billy was sworn in as a witness in the Spicer Hearing using his alias, and then testified against mining partners Wyatt Earp and Doc Holliday. Billy told the court that he resided in Tombstone, and surprisingly, that he wasn’t involved in any business at that time, an ironic statement given that he was involved in the Last Decision with two of the defendants. He stated that he knew all of the participants to “one degree or another,” and that he knew of trouble between Doc Holliday and Ike Clanton the night before the shooting. He referred to the growing tension on Tombstone’s streets as “Quite a stir.” Billy would learn from Henry Fry that Wyatt Earp had struck Tom McLaury. This would later turn into a key piece of information that Billy would pass onto Frank McLaury not long before the fight. Billy Allen Le Van. Contrast enhanced and cropped from the original C.S. Fly photo of the Le Van House. Robin Andrews Collection. 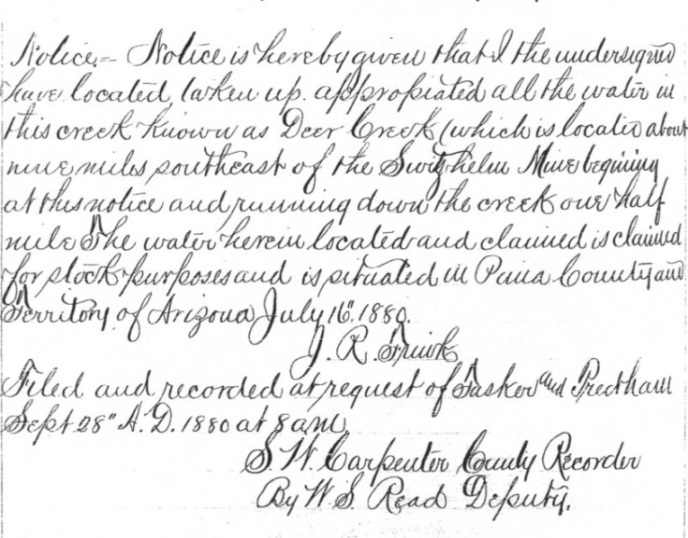 J.R. Frink arrived with Frank McLaury and Billy Clanton the day of the gunfight, and a year prior recorded the above water claim. Transcribed Miscellaneous Book 1, page 194, dated July 16th, 1880. Courtesy of Christine Rhodes. “It was an hour or an hour and a half or two after I met the boys at the Grand Hotel, where we proposed to take a drink but did not, that the shooting took place. [I] did not see Isaac Clanton at the Grand Hotel nor after that time of the difficulty, except as I saw him pass the street to the O.K. Corral with the others – not to speak to him. Allen Street facing west. The two story building on the right is the Golden Eagle Brewery. The Grand Hotel is on the left, and it was in this section of Allen Street that Billy Allen Le Van saw Frank McLaury, Billy Clanton and J.R. Frink ride into town before entering the Grand Hotel bar for a drink, the day of the gunfight. Doc Holliday’s handshake with Billy Clanton also took place at some point in this portion of Allen Street. Copy photo from the collections of John D. Rose. Billy stated that the shooting occurred one or two hours after the conversation in the Grand Hotel bar had taken place. After this conversation Frank met up with Ike Clanton and his brother Tom, and they along with Billy Clanton remained in Tombstone. Ike Clanton had been on a tear all morning, threatening the lives of the Earps and Doc Holliday. He was humiliated by his confrontation with Holliday in the Alhambra, and angry with Virgil Earp for having his pistol in his lap during the poker game. A well-armed Clanton came close to carrying out his threat against Virgil until he was pistol-whipped and disarmed on Fourth Street. 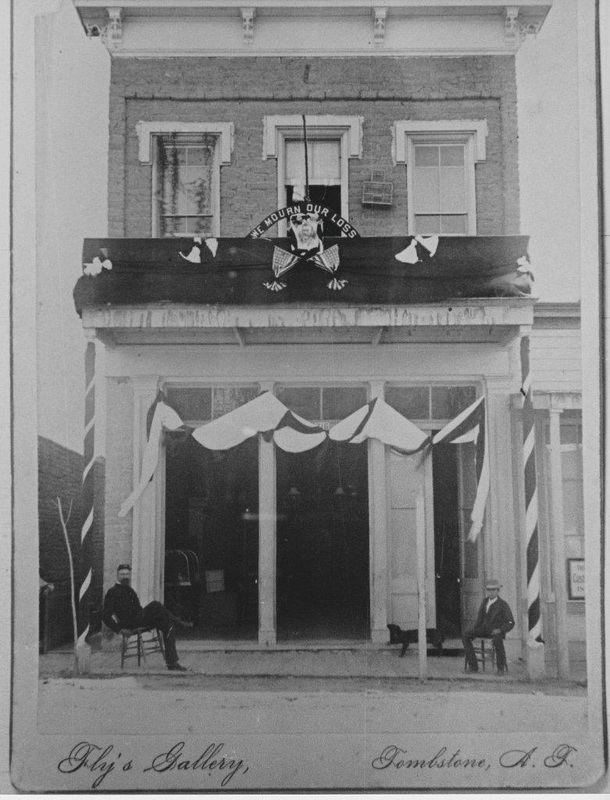 Whether Ike had influence in the matter, or Frank and company simply proceeded to complete their business in town is unknown, but they did not leave Tombstone immediately. DID BILLY ALLEN FIRE AT THE EARPS DURING THE SHOOTOUT? Billy was quoted on page 57 of Inquest saying “I saw Thomas McLaury when the first two shots were fired slap his hand on his breast, like this, and went onto the vacant lot by Fly’s building, where I could not see him. I went in this side of Fly’s building. Billy Clanton dropped down at [the] first two shots. I kept in between the building after this.” Billy is likely referring to moving to the east side of Fly’s building. Because Billy had identified himself in this area at that moment, Tom Fitch’s inquiry as to whether or not a shot was fired from there has been viewed as an implication that Billy may have fired at the Earps. If Billy Allen had fired during the gunfight, then it would stand to reason that he was armed immediately before the gunfight. And if he were walking about on Tombstone’s streets armed, he certainly would have picked a bad day to do so. Reports were going back and forth between the Earps and some citizens on edge about the armed men seen in the cowboy group along with reports of threats made by them. Men gathered along the streets as word was traveling across Tombstone that a fight might soon happen, and some were closely watching so that they could see it. R.F. 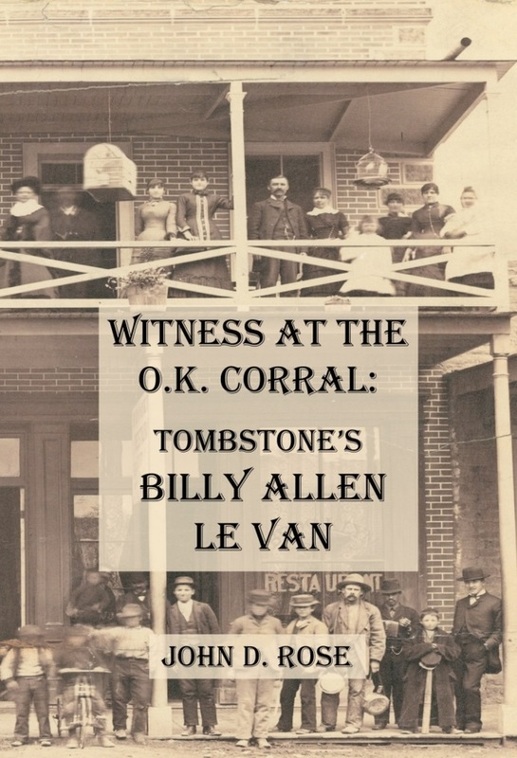 Coleman, whose account of the gunfight was published in the Epitaph, convinced Billy Allen to travel with him to see the violence that both men believed was about to occur. Coleman testified in detail at the Coroner’s Inquest, and yet made no mention of Billy being armed as he walked with him through the O.K. Corral toward Fremont Street immediately prior to the shootout. If Coleman knew that Billy was armed, he did not state this for the Epitaph account, or in his testimony. If Billy Allen was the source of the alleged shot, either Allen somehow had a weapon that Coleman had no idea was on his person regardless of his proximity to him, or he and Billy conspired to keep knowledge of a weapon a secret. This latter theory argues that although Coleman would have known of the weapon, he chose not to reveal this to the Coroner’s Jury or the Epitaph. But if Fitch had asked Billy Allen if he was armed and firing at the Earps, he would have risked making an accusation that the voluminous Spicer Hearing testimony did not corroborate. Of all the discussion of individuals firing at each other that day, not once did a witness name Billy Allen as firing a weapon during the fight. Fitch chose to raise this issue by insinuation, rather than direct confrontation. Although this dramatic claim by Earp is not supported by contemporary testimony (and it is well established that Clanton was not armed during the gunfight), he named Ike Clanton and not Billy Allen as shooting from behind Morgan. This is just what the defense did not want to hear. If it were established that the Earps used such provocative language just before bullets flew, their claim of attempting to disarm these men peacefully could look more like a chance to get even. But as was so typical with this hearing, other testimony contradicted this. Billy’s testimony was not advantageous to Wyatt Earp and Doc Holliday, and if the defense could have portrayed him as hostile to the Earps outside of the Spicer Hearing, it might have mitigated the impact of some of his accusations against them. But his next statement would challenge that strategy. “My relations with the Earps have been the best, always – always friendly.” Missing from the record is how the Earps would have answered had they been asked for their view of Billy. In explaining who he was to the court, Billy stated, “I have resided in Tombstone two years…Before I came here, I lived in Colorado-Denver-Cheyenne-Georgetown-Cheyenne in Wyoming. I have never had any other name than William Allen. They have called me other names, but this is my true name here. A man gets a nickname around the mountains.” Although it was clearly false when Billy stated “I have never had any other name than William Allen”, his latter statement was parsed so delicately that it was not an outright deception. “They have called me other names,” Billy testified, “but this [Billy Allen] is my true name here [in Tombstone].” The irony is that the last statement was much closer to the truth even as he deceived the court, but beyond the city limits of Tombstone and the boundaries of Arizona, Billy Allen was but an alias and Billy Le Van was still wanted for his Colorado crimes. 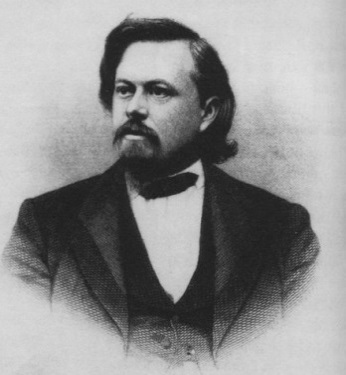 As lead counsel for the Earps, Tom Fitch aggressively questioned Billy Allen as to whether or not he was a wanted man in Colorado, but was unable to force him to admit it. Copy photo from the collections of John D. Rose. The final entry above notes Tom Fitch as one of Wyatt Earp’s bondsmen at $10,000. Tombstone Daily Nugget, October 30th, 1881. Now Billy was faced with a question that was harder to ignore than an incorrect identification by opposing counsel. The Earp defense pressed the issue again, and it was overruled and excluded. The surviving remnant (as quoted by Al Turner in Inquest) of this record states, “the court refuses to put it to the witness.” Just as he and fellow inmates sawed their way out of a Georgetown jail and fled as wanted men, Billy Allen Le Van was freed from past Colorado misdeeds once again. Copyright 2015, 2016, 2017, 2018. John D. Rose. All rights reserved.